Russia was at war with Austria-Hungary until the Bolsheviks called a halt to their side's hostilities and eventually signed the Treaty of Brest-Litovsk with the Central Powers in March 1918. Back in 1915, the Russians had enjoyed one of their few successes of the war in Austro-Hungarian Galicia and the campaign there had harvested a very large number of Austro-Hungarian Prisoners of War most of whom ended up being sent in the general direction of Siberia. 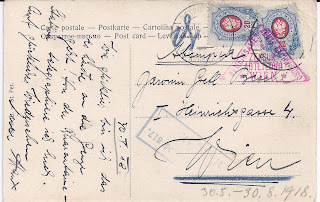 Normally, you expect Prisoners of the 1914 - 18 War to communicate by means of stampless, free post cards and Austro-Hungarian prisoners did, But at some point they - or some of them - gained access to the civilian mail system. This occurred even before the end of hostilities. The card below, for example, dates from the period of the Provisional Government. 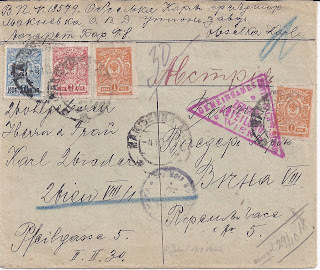 Cancelled at Slobodskoi 3 July 1917 it is correctly franked at the regular foreign postcard rate of 4 kopecks. At the top it is identified as POW correspondence in both German and Russian. 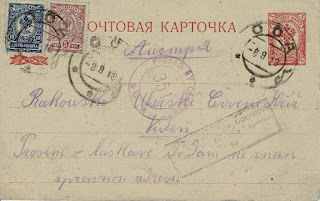 It was censored in Petrograd with two violet cachets and on arrival in Vienna with a typical red triangular cachet applied at top right over the stamps. Helpfully, the recipient has noted bottom right in pencil that he received the card on 14 January 1918. 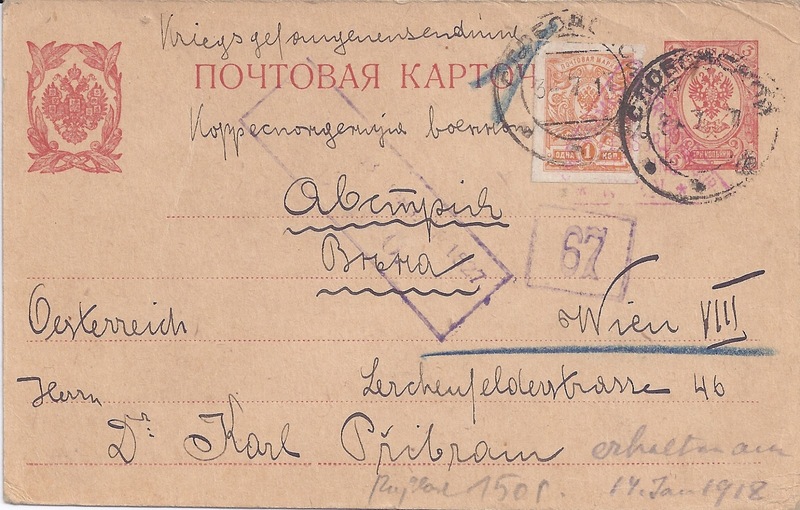 The card, written in German, begins by saying that the writer has received 50 roubles through the Stockholm Handelsbank and thanks his correspondent for the money. The handwriting and the status of the recipient (Dr Karl Pribram) suggests that the sender - who does not spell out his full name or address - is an Officer and sending cards like this (and receiving money transfers) may be Officer privileges. 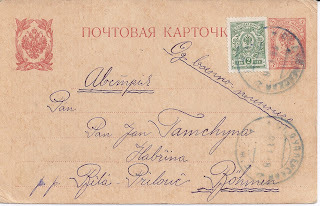 A bit more surprising is to find a franked letter from the period of the Provisional Government. 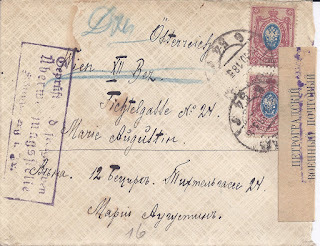 Franked at 15 kopecks, this was sent from what looks like Makeevka / Makievka in the Don Cossack Oblast on 4 October 1917 and transited through Moscow on 29 December 1917 (there is a roller cancel on reverse) where it was censored with a typical small circular violet cachet (front middle towards the bottom). 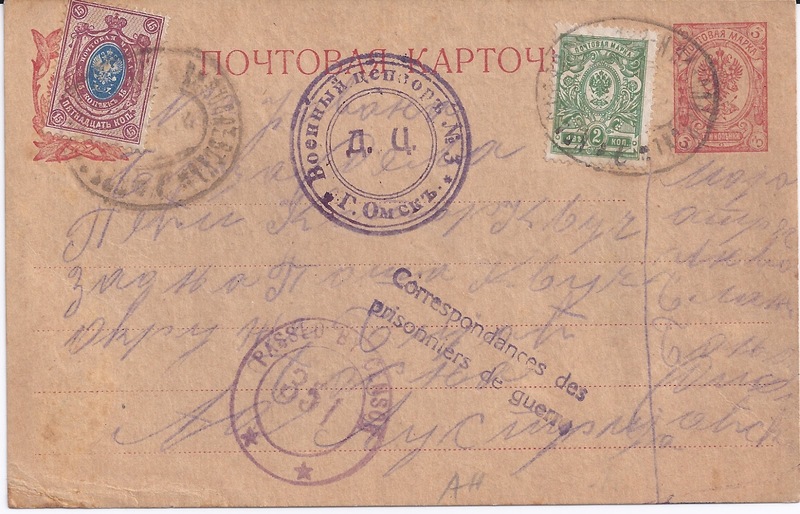 The letter was censored on arrival in Vienna with the prominent red triangle cachet and, helpfully again, the recipient has noted bottom right that the letter was received 29 October 1918 - over a year after its despatch. 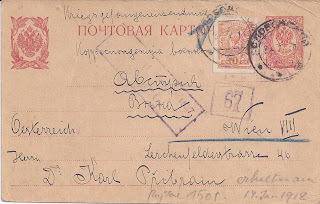 The letter is bi-lingually addressed and at the top the sender gives his name, number and what looks like a factory address all in Cyrillic. From Novonikolaevsk Voksal 2 5 18 franked 20 kopecks addressed to Vienna, no transits but Vienna red triangle censor cachets. From TPO Krasnoyarsk Novonikolaevsk 13 5 18 franked 20 kopecks censored in Omsk, sent eastwards and with PASSED BY CENSOR 351 cachet in violet and two line violet "Correspondances des prisonniers de guerre"
From Petrograd 31 5 18 (picture postcard of the city) franked 40 kopecks, Petrograd censor, Vienna red triangle censor, pencil Mss for arrival 30 August 1918. The sender writes cheerfully that he is on the way to the border and will telegraph from the Quarantine Station there. One of the puzzles with this group is the sense it conveys of two tariffs operating - the 20 kopeck RSFSR Inland postcard rate and a 40 kopeck tariff. 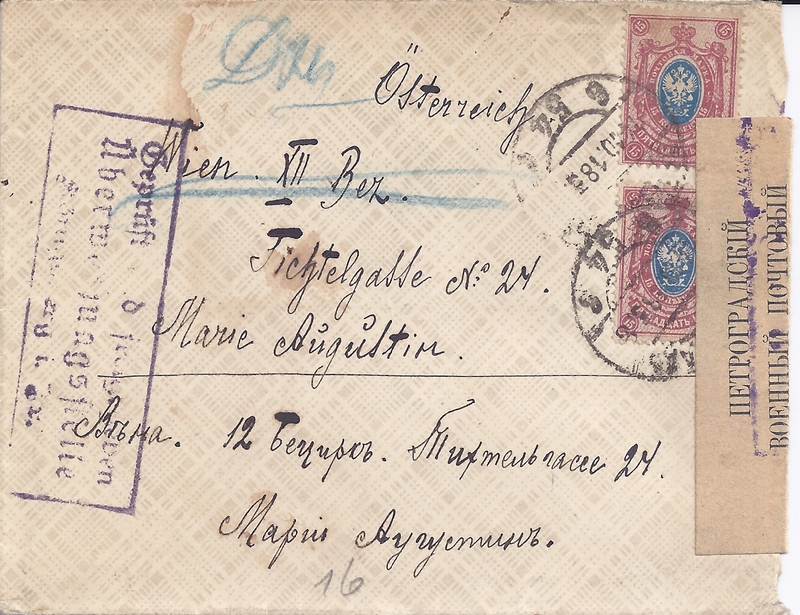 Then there is a gap in my collection until I come to the only item which looks like regular post-Brest Litovsk mail, an ordinary letter sent from Petrograd on 14 October 1918 addressed to Vienna, franked at the 30 kopecks one expects for ordinary letters sent under the Brest-Litovsk arrangements, censored in Petrograd, routed through Königsberg with a boxed German censor but with no arrival marks. 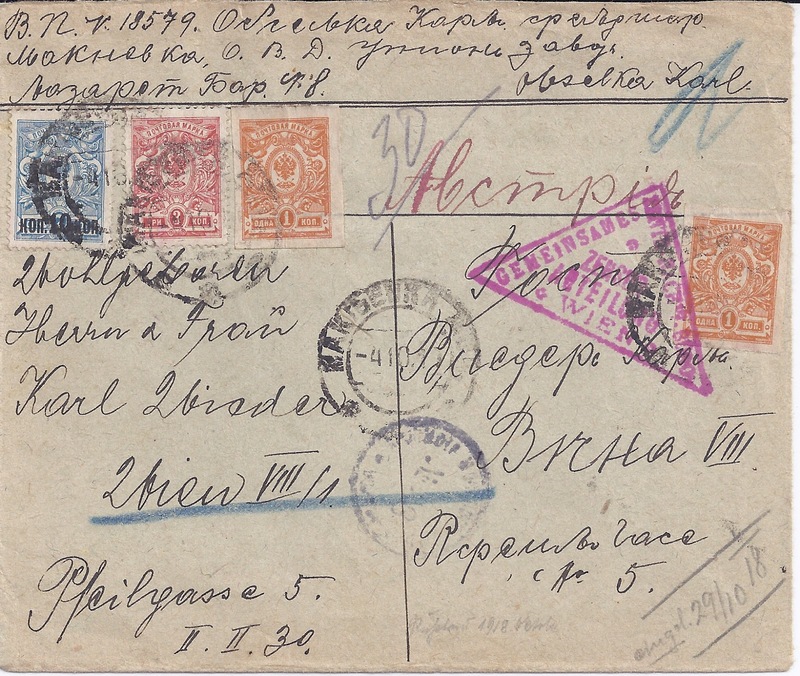 This is a late date for any foreign mail from Russia in 1918 - though foreign mail services were not officially discontinued until 1 January 1919, they had come to a nearly complete stop before then.